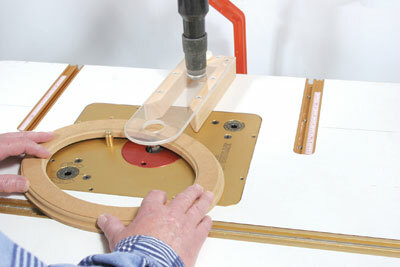 Woodpeckers is an American company offering a range of top-class router tables on a 'mix and match' basis, allowing purchasers to configure a model to suit their particular requirements and budgets. 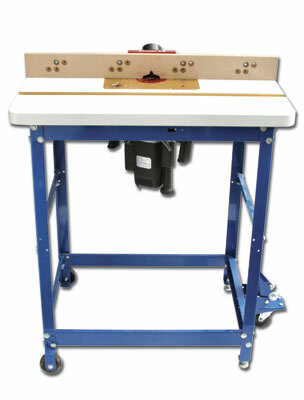 The model supplied for review was the LE32 routing centre, and came ready assembled from Wood Workers Workshop. Additional items supplied included a tall sub-fence, an Incra V27 mitre fence, vertical and horizontal hold-downs by FeatherBow, and a pressed steel dust collection box. 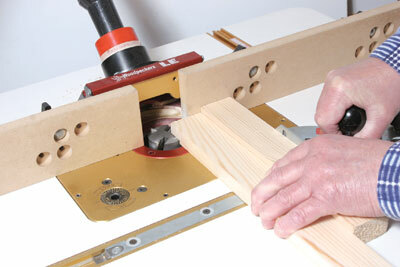 A substantial 35mm- (1 3/8in) thick laminated MDF tabletop forms the heart of the LE32 system. 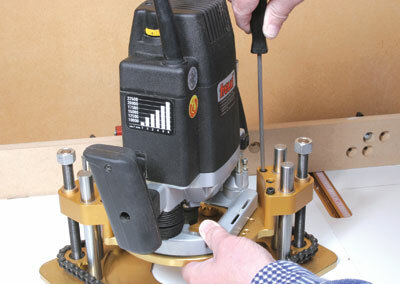 A router insert opening to take any of the range of Woodpecker's insert plates is machined in the top and set back 355mm (14in) from the front edge to maximise the work surface area. An alloy mitre fence track is set into the table to take a standard 19 x 10mm (3/4 x 3/8in) mitre fence bar. No NVR switch was provided with the table, but I 'borrowed' one from another table for the test. 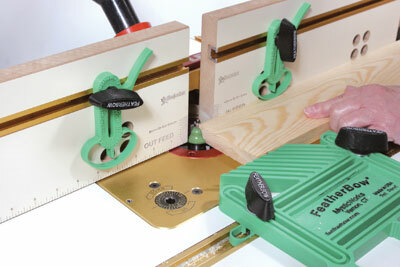 I had the use of the Unilift insert plate, with its precise 'wind-up' depth setting and locking screw to lock the router in place once the depth is set. The plate came ready-drilled in order to take a wide range of routers including all of those with the standard Elu/De Walt/Trend fixing holes, the Makita 3612C, Freud FT 2000 and its several clones, and the big Triton. 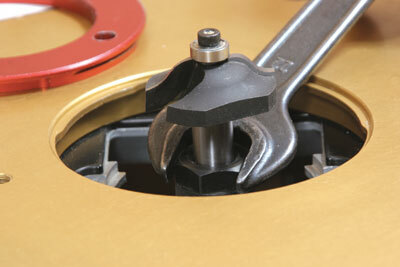 The cutter aperture is 90mm, with three reducing rings. A brass lead-in pin is also included. 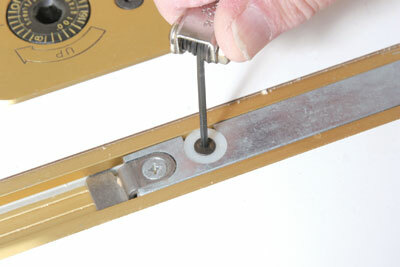 Eight levelling screws enable the plate to be set flush with the tabletop. The Unilift results in a loss of about 13mm (1/2in) depth of cut, so routers with poor plunge would benefit from the use of a collet extension. 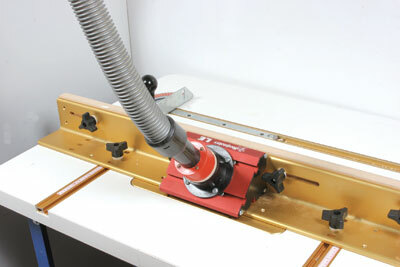 I used the Freud FT 2000 router which, with its long motor spindle, enabled the collet spanner to be used from above the table, without an extension. The LE fence is an aluminium machining carrying adjustable infeed and outfeed fences, and a dust extractor take-off point. The latter is the US standard 63mm (2 1/2in) diameter, and I used an adaptor made from an aerosol cap to connect my extractor. The fence runs in two lengths of track. A pair of metal shims is supplied to bring the outfeed fence forward for edge-planing and full-face moulding operations. An optional pair of tall fence-cheeks carries tracks to allow hold-downs and guards to be fitted. I used these in most of my testing, with 'Featherbow' plastic pressure guards mounted. The picture also shows the 'Featherbow' horizontal pressure guard. The pressed steel floor stand puts the tabletop 915mm (36in) above floor level. It comes as standard with four levelling feet, but I also had the wheel kit, which makes movement around the workshop very easy. An Incra V27 mitre fence was supplied as an additional accessory with the test model. It features laser-cut notches for precise angle setting, and adjustable expanding fittings in the bar to fine-tune the fence to run in the track without any play. I would say that this is the best mitre fence I have ever used. To get a good idea of the capabilities of this router, I put the table through the usual battery of tests, including edge moulding, tenoning profile/scribe work, panel raising and curved mouldings. 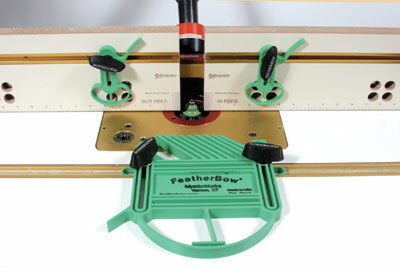 The Woodpeckers system would be at (or near) the top of my list if I were looking for a commercial router table. The optional tall fence cheeks and Incra mitre fence further enhance an excellent package. An assembly of high-class components like these does not come cheap, but the range of options for each major component gives great flexibility to cater for a wide range of user requirements and budgets. "I would say that this is the best mitre fence I have ever used"